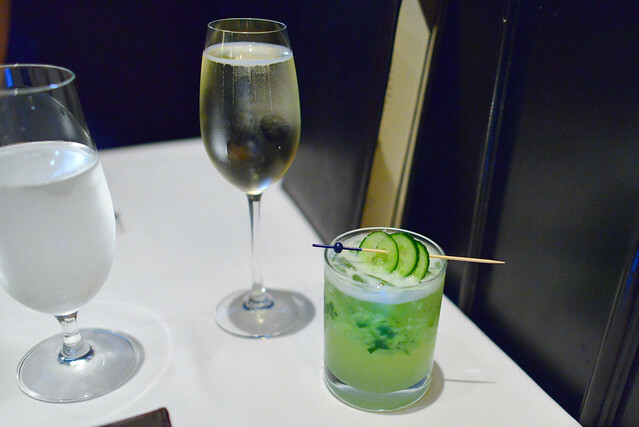 The meal began with a glass of prosecco and a cocktail. 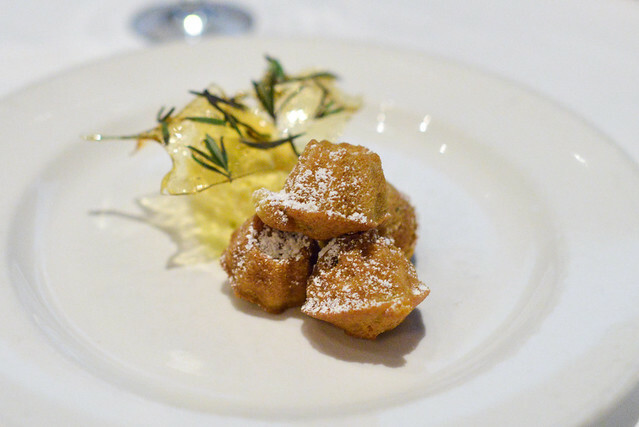 Our first taste was this amuse bouche from the kitchen. 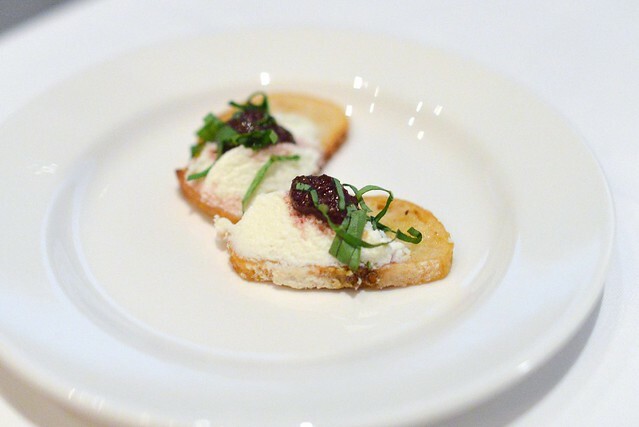 A simple crostino to show off the ricotta and olive tapenade, I found the olive flavor to really dominate. Ricotta provided a bit of creaminess to the overall bite, but the basil was lost in the olive mix. We went simple at the mozzarella bar with this caprese. Each of the individual ingredients was very good, particularly the extraordinarily sweet tomatoes. 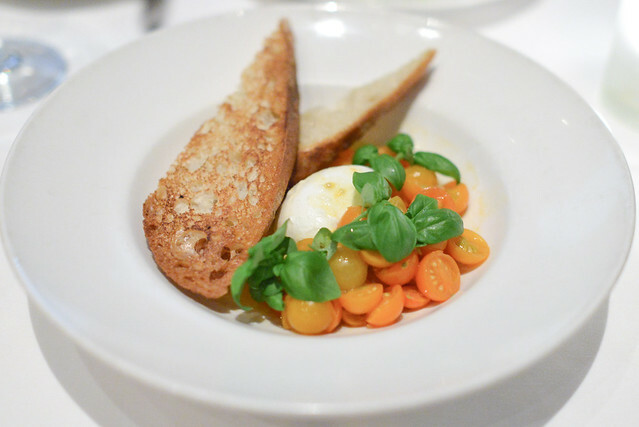 Altogether, the flavors seemed about as good as a caprese can get. The colors made for a presentation as bright as the flavors. 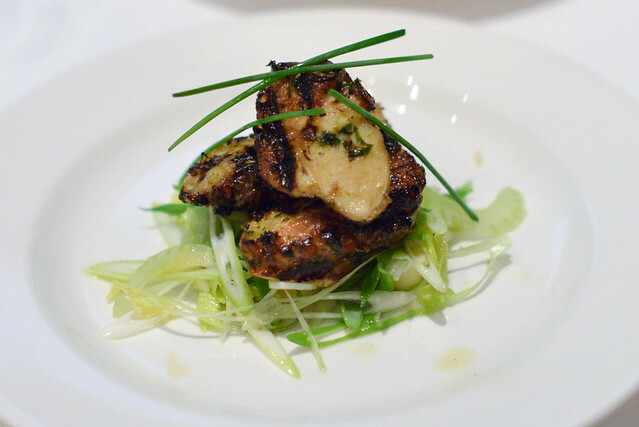 Tender chunks of charred octopus were slightly spicy, but I liked the imbued smoky flavor. Slivers of celery and scallions added a cool, crisp bite. Not really as interesting as I would’ve liked, but there was a nice balance of flavors and textures going on here. 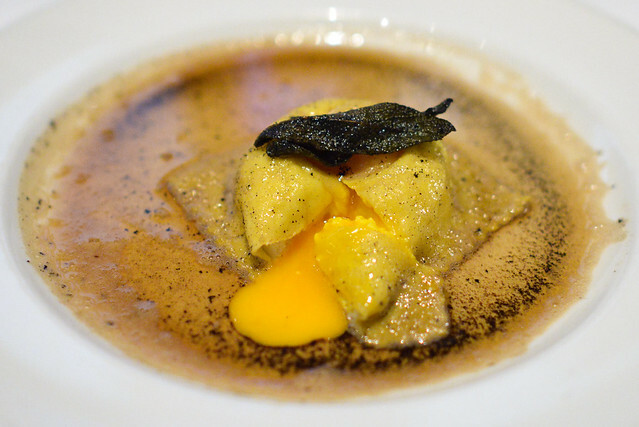 Loved the presentation of the warm, liquid egg yolk contained within this raviolo. I liked the ricotta-egg mixture, but found the pasta to be a touch undercooked for my liking yielding a bit of grittiness. 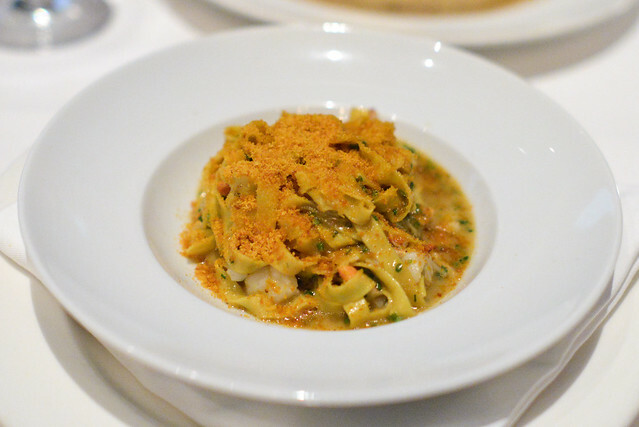 Really enjoyed this dish – the pasta was perfectly cooked, bathed in a delicious seafoood sauce. 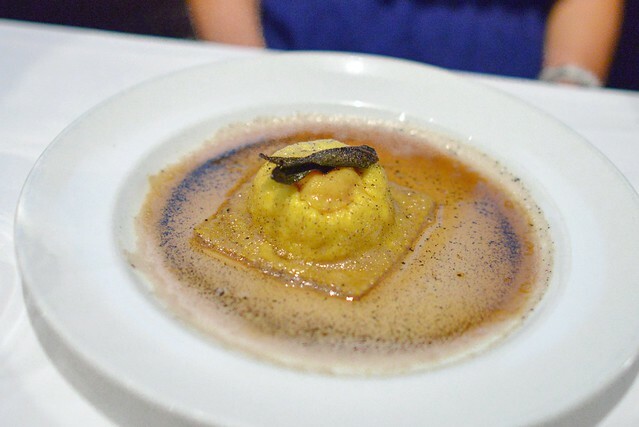 Small bits of lobster added some sweetness and the sauce benefited from the lobster and sea urchin’s depth of flavor. Very nice. 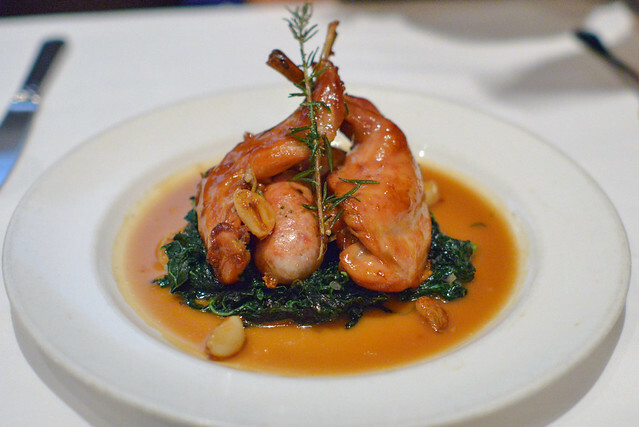 In our lone ‘main’ dish, two rabbit legs and two sausages sat on a bed of sauteed greens. Both the rabbit and sausage were cooked well, its richness tempered by the greens. The sauce was rich and sticky making this a pretty savory and heavy dish; I just wish a little more of the lemon came through to balance everything out. I really enjoyed this dessert; I think I’ve had it in almost each of my previous visits as well. I appreciated the dual application of rosemary and olive in this dish, with both of them coming together to add fragrance to the mini cakes. I really liked the olive oil gelato, rich and subtly fruity, as well as the brittle with its texture and bursts of rosemary flavor. The meal wasn’t without its faults but we left satisfied. 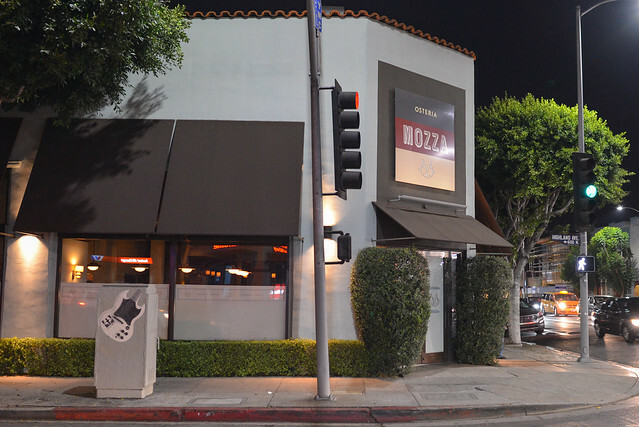 Having been to the restaurant a few times, I feel like I knew what to expect – interesting yet comfortable Italian that is a little hit-or-miss, but rarely bad. Highlights on this evening were the caprese and tagliolini, as well as the ever-reliable rosemary olive cakes. 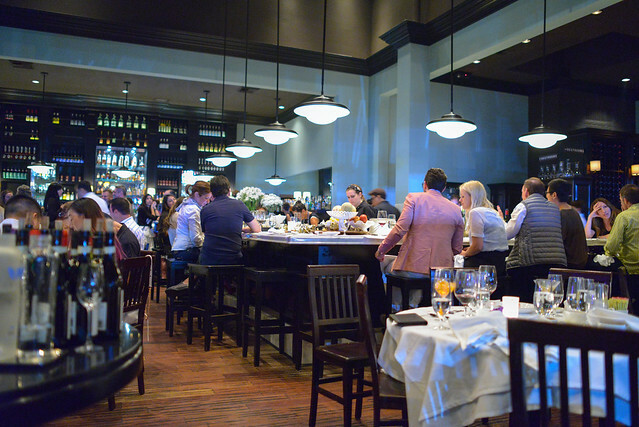 For upscale Italian, I still find myself gravitating towards Bestia, Angelini Osteria and Scarpetta, so it could be another few years until I return here.